Dave made parkin this week. 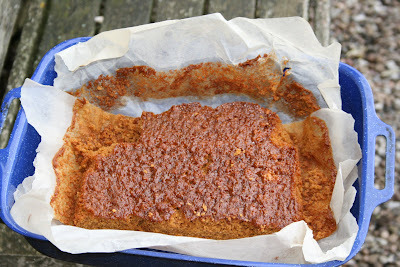 Parkin is delicious at every stage of making. Sadly, by the time I came down to the kitchen and realised what was going on, the parkin was already in the oven and he had licked the bowl. This is what remains after family ravaging. It's just like the parkin his mother used to make, complete with the top "that looks like an acned face that's been lightly Ronsealed." Line and grease a rectangular baking tin, about 12 inches by 8 inches. Beat the milk and the eggs together. Melt sugar, syrup, and butter in a saucepan. 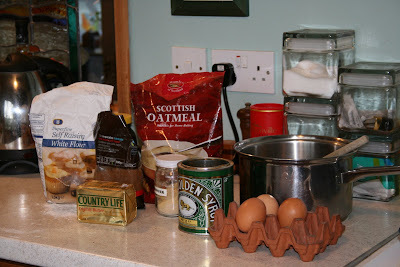 Now pour the melted stuff into the bowl and mix, and then add the eggs and milk and mix. Bake in a moderate oven (160C) for an hour and a quarter. I showed Dave the photo and he said "What a shame it doesn't show my stained glass." 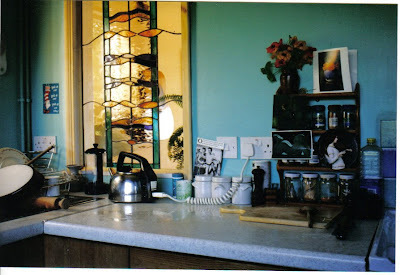 So below is a picture of the kitchen that does show the lovely glass. Hi Sue, I hope you're all right. Parkin always reminds me of my Mum. 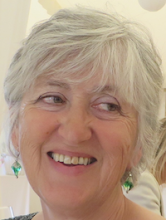 She was an expert parkin-maker and I still have her precise and very neat handwritten recipe among my 'precious papers'. I still can't make it like she did and I'm not a wonderful baker, as she was. Hopefully I'm good at something else instead and maybe I'll find out what it is very soon! Hi Marilyn, I'm doing OK, thanks. Parkin always reminds us of Dave's mum. I wonder - is your Mum's recipe very different from Dave's Mum's? Hello, I just popped in again! Mmm, yes, there are differences in the recipe because my Mum always pooh-poohed the very idea of oatmeal. I don't know why, maybe it's a Yorkshire thing. My only parkin making attempt yielded some delicious ginger nuts, which I don't really like to talk about.